The Divine dances outside of the confines of any hierarchical structures. It is complete within itself, and has a singular purpose of demonstrating the collective potential of all life within the universe. It is the archetype of perfection. It is the standard bearer of each soul's innate design and ultimate destiny. The essence of the Divine is far beyond mental conception, yet humanity's tendency is to resort to the limiting language of the hierarchical paradigm to define and understand it. Each individual can come to know themselves to be free of all forms of hierarchical control. This is not to imply that we should not trust others or join together in bonds of friendship and community. It is simply a reminder that relative truth is constantly shifting in the hands of those who desire to control. And even when the motive for their controlling behaviors may be of good will, it is still a form of control. When the revealers of "truth" within the hierarchy withhold and suppress information, they are usually positioning themselves to maintain or acquire more power rather than to disseminate empowerment to all. Spiritual leaders are able to peer deeply beneath the surface reality of life and experience how intricately connected every life form is, and how the composite of all life is intelligent far beyond measure. These visionary leaders can thus interpret reality through their personal abilities to perceive and express life's dimensional depth and limitless intelligence. Yet no one is able to articulate life's full dimensional depth and breadth with the tools of language. They can only, at best, describe their interpretation or their impressions. In actuality, all of us are able to peer beneath the surface reality of life and perceive a unique vision of the universe. We require only time and intention to develop our own interpretations. And this is precisely what many great spiritual leaders have taught. Life's deeper essence is not an absolute to be experienced by the chosen few, but an evolving, dynamic intelligence that wears as many faces as there are life forms. No group or people has the exclusive portal into the universe by which the Divine expresses itself in all its majesty. The portal is open and available to all, because the Divine is within all things. Those recognized as great prophets each produced a vision of the universe beyond what was currently defined by the hierarchy. Because their interpretations were articulated with authority and depth of insight, they became a target of debate among various groups in the hierarchy. This debate then created a polarity of belief. A sympathetic constituency emerged to defend and embellish their leader's interpretation, while established groups held it in contempt of previously held beliefs. Invariably, the leader's vision became confined and shaped into dogma by followers who desired to create a new religion or sect. Thus, this infusion of fresh insight quietly receded into the hands of the hierarchy, where its deeper meaning was obscured by the very fact that it was incorporated into a rigid structure that both protected and promoted it. As there are relative truths, there are relative freedoms. As individuals evolve through the hierarchical process, an ever-increasing sense of freedom is gained, yet external forces continue to exert control through limiting language, confining belief systems, and more. These controlling influences lead to continued reliance upon the hierarchy as it unceasingly attempts to impose a sense of inequality between us. The underlying equation of the hierarchical paradigm is: individual + hierarchy = God connection. In the case of personal transformation it is: individual + inner wisdom and understanding = divine equality with all. The time has come to integrate the dominant paradigm of the hierarchy with the liberating transformation paradigm. 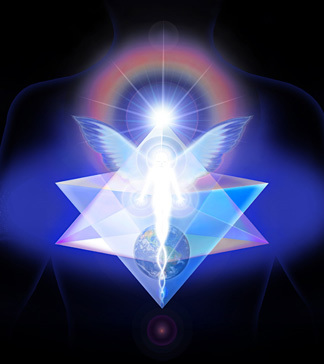 This integration occurs naturally once we have fully explored the two paradigms and develop a synthesis paradigm whereby transformation is attained by searching for connection and wholeness through our own inner wisdom and understanding. It is this combination of release from dependency on the hierarchy and transformation from within that initiates the synthesis paradigm. All of the highest imaginings of humanity are yet unaware of our deepest foundation. We have sought the upper reaches of the building, yet remain unaware of the foundation's design. It is here, at the very core of existence that the Divine is bursting forth with its creative energy while simultaneously reintegrating with its invitation to wholeness. It is here that equality is realized, not in the lofty places of relative truth lodged in the hierarchy, but rather in the deepest part of the foundational plan of life's original source and ultimate destiny. The origin and destiny of existence is the tone of equality in life. Listen for this tone – this frequency of vibration – and follow it back into the very foundation from whence all things arise and return. Consider these words as symbols only. Feel the truth that stands behind these words, and tap into this empowering energy force that reaches out for you. Know it as a tone or vibration – a resonance that waits for you around every corner in which your life will turn. It is a beacon of the Divine gathering itself into the form of language in order to usher you to a place from which you can experience the formless tone of equality – the bypass of limitation. It is the primal language of our divine source that bestows to you the freedom to generate your own deepest beauty in the expression of your highest truth.